Ćwarmin's equivalent to 'the X one' (where X is an adjective) has a little split - half the time, it's as easy as inflecting an adjective for a case and definiteness; the rest of the time, it's less easy. Ćwarmin only permits adjectives to stand independently as nouns in the definite and specific forms; an indefinite NP requires a nominal head. For the definite and specific forms, just take an adjective and add the def/spec case marker on it. For indefinite adjectives, there must be a noun that is a dummy head of the NP. There are several nominal heads that can be used for this, and here the patterns that determine their usage is described. There is also a pair of very vague words, erkar, erter (lit. one-who, one-what) which can be used for almost anything. However, many of the words above are extended by some form of metaphor, so kalć, for instance, covers nearly any tool or implement, ogmo likewise covers many tools and implements, but also building material (even wood! ), kic covers anything spotted moving in water (including boats! ), loma covers anything in the sky, and yulzvonar covers any group of people ready to fight. With case forms that lack definiteness, leaving these out is basically syntactically well-formed, but for most Ćwarmin speakers, if the nominalized adjective is semantically indefinite, it requires a noun, if it's specific or definite, it does not. Thus, definiteness marking with independent adjectives is obtained by absence of a dummy noun, which might be typologically unusual. Welcome to the 8th edition of the Language Creation Tribune. Wow! I can’t believe I’ve been President for two years now! (And no one is plotting my demise as far as my spies have been able to ascertain, so I must be doing something right! Sorry, did I say that out loud?) Anyway, I am glad to be of service to the conlanging community, and I hope to carry on with it! As you know, 2016 is what we could call an “LCC-less year.” Since the LCC4, the Language Creation Conference has been a biennial event, a schedule that fits our organisation well. However, as I’ve heard people saying they would like more frequent LCCs, even calling for “regional” or “informal” LCCs in off years, I thought I might clarify what my thoughts are on this. First, people may remember that I’ve been saying that the conlanging community cannot support LCCs happening more frequently than once every two years. I want to explain exactly why I think this is the case. I’m not talking about a lack of interest—I know the interest is there. It’s not even a problem of getting enough people to attend a yearly LCC, although I do think that this could become an issue. Conlangers are typically not a very wealthy lot, and attending an LCC is not a cheap endeavour (especially if you have to fly to attend it). That’s why we try to keep attendance costs to a minimum, while still offering as much as possible (free lunches, for instance). This does mean that, given the costs we have for each LCC, we tend to run them at a loss. It is a manageable loss, given the current LCC biennial schedule, but I’m concerned that it would get worse if we moved to a yearly schedule. A yearly schedule would probably mean fewer participants at each LCC (many of us just don’t have the means to attend every year), which would mean a larger loss for us at each LCC (only part of the costs of an LCC is dependent on the number of attendees; venue location, for instance, is a fixed cost, regardless of attendance), which could easily start eating into our reserves unless we either increase attendance costs or remove features like free lunches. Both those measures would likely cause even fewer people to participate, meaning we would end up operating at an even larger loss… You can probably guess where I’m heading with this. As for LCC6, Pete Bleackley’s bid ending up winning not only because it was the best proposal (although it always looked really good, and it would probably have won against other proposals), but because every competing host retracted their proposal before the deadline was even reached! The issue here is quite simple: organising an LCC may not be extremely hard, but it is definitely time-consuming and (at least somewhat) stressful. The organisers really need to have enough time and energy to handle it, not to mention a very stable situation, or they simply won’t be able to handle the additional pressure. It’s not for everyone, as many have found out. Moreover, making a proposal isn’t just about throwing a few vague ideas about a venue. We need concrete plans for venue, lunch and technology, cost estimates associated with them, and more (see our checklist—warning: PDF). So in the end, the main issue is not that the conlanging community cannot support attending more than one LCC every two years; instead, it’s that it cannot realistically support organising more than one LCC every two years. That’s also why I don’t think proposals for “regional” or “informal” LCCs will help during our “LCC-less” years. LCCs are by nature already regional enough, and it’s definitely not the formal part of an LCC that is the bottleneck here. For now, we should keep our conferences on a biennial schedule—a schedule that works for our community and that allows the conferences to continue being great events. That said, the need to meet like-minded people is strong, and I completely understand and share it. So what can be done during LCC-less years? Organising some event yourself. It may sound daunting, but I am not talking about something of the size of the LCC. I am not even talking about something like a conference. There are plenty of other things you can do to attract other conlangers, or at least people interested in conlanging. An exposition (schools and universities may help providing the necessary venue), a screening of the film Senn or of the upcoming Conlanging, the Film documentary, for instance, are ways to attract people. We can, once again, help, both with advertisement, advice, organising support, and even possibly financial support. And these are just a few ideas on top of my head (you can also consider promoting conlanging in your area—a very good way to meet conlangers that you may have not known were even in your neighbourhood). Really, the LCC is just one out of many events that could be organised around conlanging. If you choose to take a step and organise an event or outreach, we are happy to support you. Also, don’t hesitate to discuss possible events to organise on the Members List. Who knows, there may be other people among our members who would like to help you! So, go ahead and start organising! Let us know, and we’ll do our best to support you! While I tend to seek out the odd and unusual when looking for material for this column, I also like coming across conlangs that simply demonstrate the author’s intense ardor for the craft of conlanging, along with an impressive level of detail, originality, and a scholarly exposition of the material. A great example of this kind of conlanging work comes from linguistics student Zachary D. Hart. 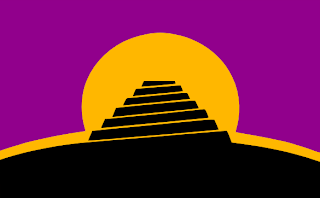 Zach is the creator of several conlangs associated with his conworld creation The Republic of Ánhrush on the planet Askath. The primary language on this world is Gomain, and Zach has spent over a decade lovingly composing an official Gomain Reference Grammar. The attention to detail and overall academic rigor of the Gomain Reference Grammar is truly admirable. It is a model for other conlangers in putting together their own grammars. And the language itself is a testament to what can be accomplished in natlang-style conlanging, displaying not only an attention to detail but also the sorts of subtle, only-in-real-life grammatical quirks and lexical oddities I talked about in my presentation at LCC5 that add real verisimilitude to a natlang-style conlang. Con-cultural background and con-history are all discussed in the introductory sections of the grammar, followed by sections devoted to phonology, morphology, syntax, lexical domains, dialects, an appendix on irregular verb paradigms, and a dictionary. The above examples only hint at the richness of the Gomain language and its associated con-culture. Check it out! 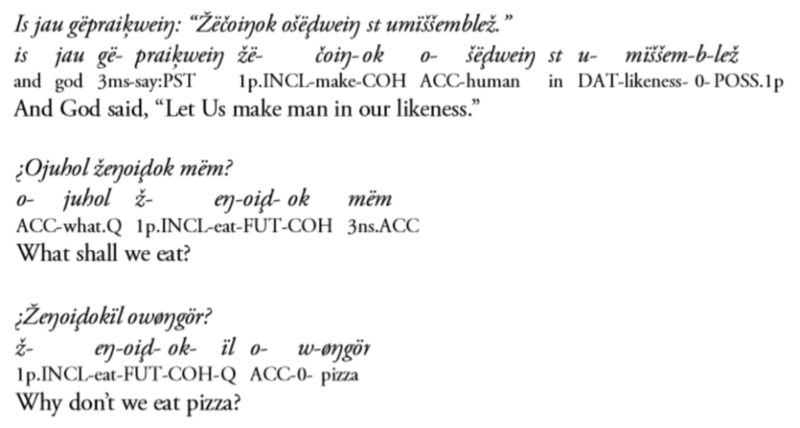 I mean, after all, how can you not want know more about a language whose word for “pizza” is øŋgör? The New York Times published an article titled “Create Your Own Language, For Credit,” which discusses colleges that offer courses on conlanging. FarpointCon took place Feb. 12-14 in Maryland; this year’s convention celebrated the 50th anniversary of Star Trek; Marc Okrand spoke about Klingon at the convention. Karen Myers offers advice for creating a language for a fantasy novel. Abstract: The show Defiance aired on the Syfy network for three seasons from 2013 to 2015. It featured four full conlangs, each with its own writing system. This paper details some of what went into making that a reality. Abstract: In this essay George Corley expands on his “Design Parameters for Romanization” (Corley 2011), defining five parameters for designing and discussing conlang romanizations: elegance, accessibility, aesthetics, internal history, and technical factors. He applies this framework in a detailed discussion of his own process designing the romanization for his current conlang, Middle Pahran. He pays special attention to overspecifying the phonology for accessibility, and to the compromises he made due to the technical limitations of the software he uses. Abstract: This paper shows general instructions to create a computer font for Xiis (a conscript made by George Marques). It uses the free (libre) font-making application FontForge to overview the basic knowledge of OpenType features needed to make fonts for more complex writing systems and how they were applied to Xiis. Maria Rui Corley (王柯睿 Wáng Kēruì), daughter of George Corley and Li Wang Corley, was born on December 17, 2015 at 11:25:04 pm. Congratulations to the Corleys! 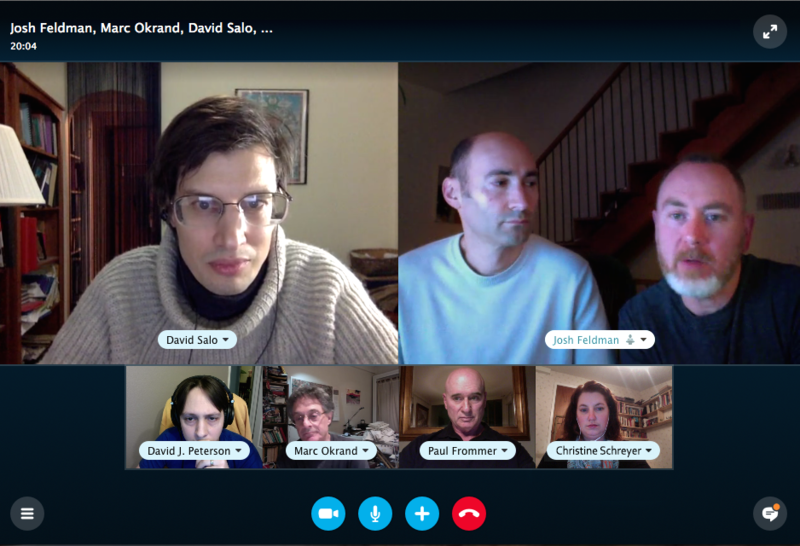 Post-production work continues on the Conlanging documentary by Britton Watkins, his husband, Josh Feldman and producers David J. Peterson, Christine Schreyer, David Salo, Marc Okrand and Paul R. Frommer. A crowdfunding campaign IS coming in March and Britton, David P., and Josh will be speaking on a workshop panel about conlangs and the film at Silicon Valley Comic Con (SVCC) also in March. They will be showing a 15 to 20 minute custom preview of the film at that time. If you can make it, please come. The custom preview will only be shown as a one off special sneak peek at the workshop event. Thank you, All, for your continued interest and support. John Quijada has released a second music video from his Kaduatán progressive-rock music project. The new song is called Unk’àtân (the Ithkuil word for “renegades”); as with his first song, David J. Peterson sings the lead vocals in Ithkuil. The lyrics to the song with translation can be viewed on the “Texts” page of the Ithkuil website. Lorinda Taylor completed the final volume of the SF/F series The Labors of Ki’shto’ba Huge-Head. 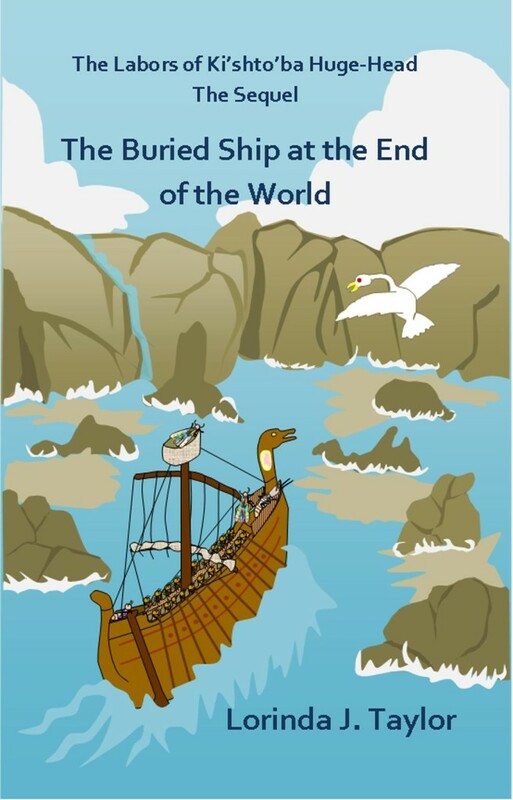 The series incorporates her conlang Shshi, which is spoken by extraterrestrial termite people; the final book is titled The Buried Ship at the End of the World. Earlier volumes in the series are included in LCS’s library and have received positive feedback from our members. My previous Miresua conlang word for ocean was oztari. This is a small change, a tweak, to make the word look more like the Finnish word for sea. This post was in draft mode yesterday, but I forgot to post it. So I'm going to fudge the posting date. Let's pretend I posted this word last night. The word ocean doesn't occur in Alice's Adventures in Wonderland or Through the Looking-glass. To come up with bizarre voices, one needs to come up with bizarre restrictions that make them reasonable. One imaginable restriction that could make such a thing reasonable would be this: subject pronouns can only refer to previous subject nouns, whereas object pronouns can refer to subjects as well as objects. I wrote a book. It flopped. I wrote a book. flopped-BIZARROVOICE it. a student did not arrive can only mean a specific student did not arrive. However, did not arrive-BIZARROVOICE a student can mean 'not a student arrived', i.e. no student arrived. The voice could imply lack of volition, or somesuch?. It could further have the regular object either be demoted to some kind of oblique position, or maybe permit for double (and even triple?) objects. Maybe a subj→obj→ind.obj→obl hierarchy exists. A quirk on that could be that things only are demoted if they are pushed, so e.g. an indirect object only turns oblique if there's a direct object that is demoted. Consider a special marking on numbers that is used when finishing counting. This replaces both ordinals and cardinals. ... twenty-two, twenty-three, twenty-four, twenty-five, twenty-six.[end-morpheme]. Possible origins: markers for perfect or perfective aspects, or maybe reduced verbs (a structure expressing the idea that now, 'twenty six (pieces have been) counted'). Another source could be as simple as 'and' or a word like 'last'. And finally, maybe congruence with the noun class of the counted things only appear on the final number, and thus serves to signal completed counting. Finally, some kind of superlative marking could work? Potentially, 'last' could already have a superlative marker in it (consider how English 'last' ends in what probably is the superlative morpheme, much like how the un-cognate word 'sist', with the same meaning, has the superlative morpheme in Swedish) - so a reduced 'last' could bring with it the superlative morpheme anyway. But without bringing 'last' into it, maybe the final number is considered the greatest of the bunch, and just therefore it gets the superlative marker. This would be pretty neat. Keep in mind that not all languages have comparatives and superlatives, though. In Chukchi, the absolutive case - which is pretty much what you'd expect from the label - is formed by root reduplication. I guess if a conlanger did that, we'd all be having at him or her for being unrealistic. I should probably ask for forgiveness regarding the colour combinations I have used for the table. There are a number of minor irregularities with regards to the usual nominal case morphology. There's also a case distinction that is missing from most other nominals - the possessive vs. comitative distinction. The interested reader might try to ferret out cognates to the Ćwarmin pronouns. You are currently browsing the Conlangers blog archives for February, 2016.